Six months ago Ford hired 100 people to chronicle their experiences driving European-specification Fiestas on U.S. roads. Ford Motor Co. is betting that the small-car segment will continue to grow and that the Fiesta will be the right vehicle at the right time. The 2011 Fiesta is Ford's newest car. The company plans to tout the Fiesta, which is smaller than the Focus, as having class-leading craftsmanship and quality. U.S. sales begin next summer. “Small cars, B- and C-sized cars, are the single largest opportunity for growth” at Ford,” Mark Fields, the automaker's president of the Americas, said during an embargoed Fiesta event last month. For the first 10 months of this year, small cars -- , such as the Chevrolet Cobalt, Ford Focus and Toyota Yaris -- accounted for 26.9 percent of U.S. car sales, up from 26.7 percent last year, according to the Automotive News Data Center. During the same period, the segment accounted for 14.8 percent of all U.S. vehicle sales, up from 14.3 percent last year. “We are finding that small-car buyers are not entirely motivated by necessity alone” -- meaning factors such as income, Fields said. In fact, “65 percent of small-car buyers have household incomes of $50,000 or more,” and about a quarter have household incomes of $100,000 or more, he said. Driving buyers to small cars is a greater awareness about fuel economy, concern about carbon dioxide levels and the density of traffic in urban areas, Fields said. Ford will tout the Fiesta's refinement, such as its quiet interior. To reduce interior noise, the car has an acoustic laminate windshield, hood blanket and headliner to absorb and mitigate sounds. The car also will offer features such as Sync with turn-by-turn navigation, push-button start, a remote starting feature and heated seats and outside mirrors. Two Fiesta models are planned for the United States: four- and five-door body styles. Production is set for Cuautitlan, Mexico. The front-drive car will be positioned below the Focus. The Fiesta's competition includes the Honda Fit and the Toyota Corolla and Yaris. To create a buzz for the car, six months ago Ford hired 100 people to chronicle their experiences driving European-specification Fiestas on U.S. roads. The program, called the Fiesta Movement, has generated more than 5.5 million YouTube video views and 675,000 views on Flickr, a photo-sharing site, according to Ford. By comparison, the awareness level for Fiesta is “higher than the Nissan Cube, Kia Rio, Smart, even the Scion xB,” he said. Additionally, 60,000 people have expressed interest in possibly purchasing a Fiesta, said Farley. Interested customers will be able to build a Fiesta on a Web site and learn how they can reserve a car. People purchasing a vehicle will be given Sync and a premium sound system for free. 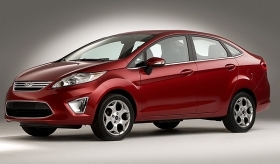 Additionally, their Fiesta will be given priority vehicle delivery. North America is the last market to sell the Fiesta. The car was launched in Europe in 2008 and Asia in 2009. Ford said more than 500,000 vehicles have been sold worldwide. The car has won 10 major awards throughout Europe. The original Fiesta product plan did not include North America. Safety, emissions and powertrain problems had to be addressed for the United States, said Derrick Kuzak, Ford's group vice president for global product development. “We did have to change some parts. By percent value, across the entire value of the vehicle, the number of common parts is 60 percent between North America and Europe,” Kuzak said. By comparison, the next-generation Ford Focus is being engineered for all global markets including North America. Kuzak said 80 percent of the parts by value will be shared between North America and Europe. The redesigned 2011 Focus goes on sale late next year. Kuzak said commonality helps the automaker reduce costs and improve quality. The vehicle platform was engineered by Mazda and is shared with the Mazda2. Ford Motor expects to sell over 1 million vehicles annually on that platform. “When you total this all together, this is the way you drive profitability into small cars,” said Kuzak. The Fiesta is available with one engine: a 119-hp, 1.6-liter four-cylinder with 109 pounds-feet of torque. A five-speed manual is standard. A dual, dry-clutch, six-speed automatic transmission is optional. Ford says the transmission will provide quicker shifts and provide fuel economy comparable to a manual. Electric power steering is standard. For fuel economy Ford is projecting 29 mpg in the city and 38 mpg highway with the manual transmission. With the automatic, the highway projection remains the same but the city increases 1 mpg. A fuel economy package boosts the highway number to 40 mpg; the city fuel economy is unchanged. The Fiesta has seven airbags including a driver's knee airbag. Antilock brakes and stability control are standard.